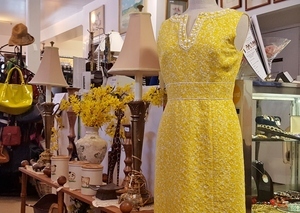 Fantastic Finds, an upscale resale shop at 400 King Street in Chappaqua, NY (in the Talbot’s shopping center), will celebrate the season with a special Spring Fling on Saturday, April 13, from 10 am to 4 pm. During the Spring Fling there will be free refreshments and basket drawings, pop-up sales and more. With your purchase receive a discount coupon to use another day. It’s a perfect time to start shopping for your spring and summer wardrobe, and for all of those special family events. Merchandise includes gorgeous clothing, jewelry and accessories for both men and women. Shoppers will also find many beautiful items perfect for gift-giving, such as a large selection of glassware, artwork, housewares, china, home decor, bric a brac, and more. Fantastic Finds boasts a wide inventory of new and gently used items in pristine condition. All proceeds from sales at the shop benefit Support Connection, Inc., a 501 (c) (3) not-for-profit organization based in Westchester which provides free, year-round breast and ovarian cancer support services. The store is staffed with volunteers who handle sales, inventory, and accepting donations. Regular store hours are Monday – Saturday, 10 am – 4:30 pm.